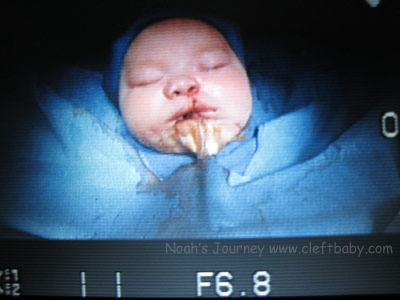 When I heard cleft lip and palate from my OB the first thought in my head was oh no, surgery…I was crushed. At that point I had no idea when the surgery would take place and at what age. But just the thought of putting my child through that made me weak in the knees. My older girls had tubes placed a number of times, but that was nothing like I knew this was going to be. This was the real deal, this was going to hurt and we had no choice. 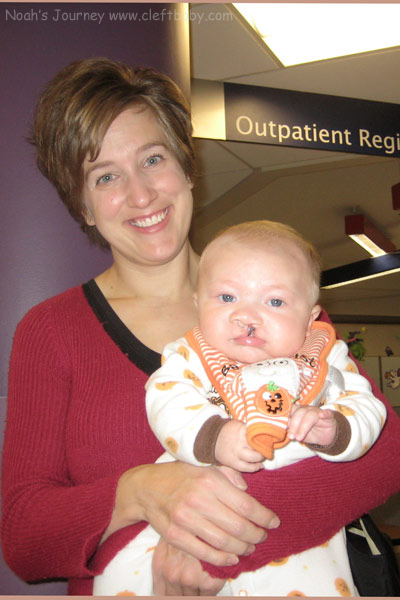 For Noah, this was a necessary step to repair his cleft. Thankfully when we met Dr. Rozzelle, Peggy and the team at Children’s my husband and I walked away knowing it was going to be ok! My wonderfully optimistic husband I’m sure wasn’t as worried as I was from the start. Remember, he is that rock that is always the voice of reason when I’ve melted to a virtual puddle from worry!! He certainly was right not to be worried, because even with the risks associated with surgery they are small and it is pretty safe. No one will ever know what the outcome of surgery can be, especially the first time. Some kids sail through with no issues while others don’t tolerate the surgery as well as expected. No matter what, that risk factor never goes away. You just realize that what needs to be done, needs to be done. So many things in life are a risk, this is no different. Noah had his lip repair at 4 months and his palate repair at 8 months. Those were daunting appointments to make. It was as if I couldn’t plan my life past those dates, they were just that big. I couldn’t see past them. Looking back, I see that had I been able to see what I do know. I should have just realized that all would be well. Noah’s lip repair was in October 2009, just before Halloween. We brought him early to the hospital dressed in the cutest Halloween jammies. He was all smiles, happy as he always is even though he was likely hungry for breakfast. In our case, were we blessed to have this amazing opportunity to work with the Detroit Medical Center and Children’s Hospital of Michigan to allow them to video Noah’s surgeries. So after getting to pre-op we had a chance to meet the medical team working with Noah that day, then took time to talk to the team doing the video and give an interview. It felt good that day, we were there to accomplish the first step in Noah’s repair. We would soon see a second “first” smile. The medical team was fantastic. They were so helpful in making sure that they could easily take Noah with them without Noah erupting into tears. They paid attention to that level of detail, it was priceless to me as his mother who was already on the verge of being distraught! When they did take him, I will admit it was likely the hardest moment I have had as a mother. But I knew he was in the hands of a very skilled surgeon and a medical team who were also highly skilled. Even though I was scared out of my skin, I did feel it would be well. Recovery for Noah was almost a non issue. I couldn’t believe how resilient this little guy was! He just amazed me! He was in his room by 1pm and by 7pm he was taking milk from his haberman like it was nobody’s business. He loved his food and he sure showed it! He was on morphine and that certainly helped him that first night. He did manage to sleep, in bed and I got a little shut eye myself. From there, for Noah, things just kept looking up. We had been taught to flush out his nose with saline, which was a saving grace. The more we kept his nose clear from drainage the more he ate and the better he felt. Even though Noah did so well, it was still a challenge. He was sore, he did cry and all we could do was give pain meds while allowing the healing process to continue. I stayed with Noah for one night and we went home the following evening. By Halloween, 5 days later, his bandages were a great part of his costume and he was happily out with us securely snuggled to his daddy in the front carrier. 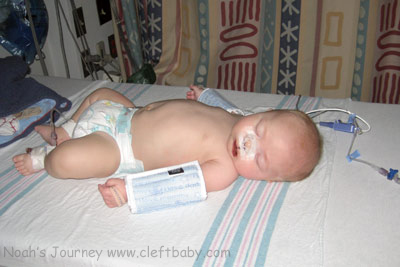 Some babies do go back to a newborn stage post surgery, some don’t tolerate it well. But it certainly depends on the child. Noah came home and on night 2 post up he slept for 13 hours straight, we were told night 2 is the worst. Thankfully for Noah, that didn't apply. Other babies take weeks to recover and get back to routine. Be prepared that their schedule could be off for weeks, it happens. But just go with the hope that your baby will bounce back fast!